Australia is globally renowned for its spectacular beaches and relaxed lifestyle. As Australia’s number one swimwear brand, this is the essence that Seafolly encapsulates and brings to the world. Seafolly has been creating stylish, innovative swim and beach wear known for exceptional fit, and has become the Australian beach ‘go-to’ brand and an Australian fashion icon. Seafolly recognizes that women are all shapes and sizes, and they want high quality swimwear that reflects their passion for fashion, but also makes them look and feel their best. Ultimately, Seafolly believes it’s about providing exceptional fit . . . driven by a commitment to trendsetting design, the use of innovative, high quality fabrics and immaculate garment construction. Producing exceptional summer style and their sought after fit that allows their customers to continue to live life with Seafolly. Didn’t look as cute as I thought it would. Style looked a little frumpy on. Very cute & flattering fit that covers well. The only complaint is the boning in the front is hard and would hurt to wear surfing and rub. I'm 5'4'' and 130 lbs and ordered a medium for a casual look, but it was very over sized and long so I returned it. I love this bottom. It's maybe not the sexiest bottom, but you pull it on and it's like, ahhh. If your figure is not perfect, then more coverage can be more attractive and slenderizing. I am a fit, but older woman, so it's great to have the high waist. Fabulous for women who have had children. I went down a size from the other bottom I bought, the Seafolly twisted bottom. In that one, I liked a larger size. This one looks better pretty tight. Still, Seafolly runs small. I am either a 27 or 28 in jeans, and the size 8 was snug, but not too tight. Love this coverup! I’m 5’9” and 55 and wanted something modest and stylish and this is both! The fabric is a nice weight and has the right amount of crinkle. This is well made, however, the model in the photo does not reveal that it is cut for a pear. The bottom half flares out - great if you are 9 months pregnant or iron your pants on the driveway. It is big and baggy beginning just about the waistline and goes out from there. It is like wearing a sail. Very weird cut, because the shoulders and to the waist are fine. I got a small and I am 5'6" - it would make no sense to get an extra small with the geometry of this. Perfect nice little vacation or around town dress. All cotton which is nice because so many like this are made of polyester. 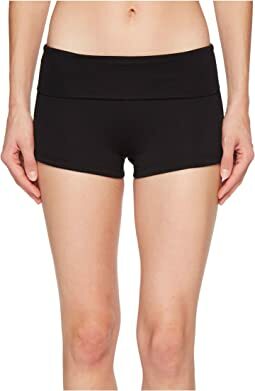 I am a size 30 D and I ordered Aus size 10/US size 6. It fits fine and is very comfortable. It has good support and the strap can be tied around the neck or around the back to wear as a bandeau. I did return the bikini top only because I have had several surgeries and the top did not hide some of my scars. So, if it weren't for that I would keep it. I've worn Seafolly for years and their suits last a long time and wash well. It is so fun and versatile. Loved it so much that I bought it in black and navy. I really wanted to like this one... first of all the bust padding is much too heavy, adding at least 2 cup sizes, and not naturally. Second, and this might be a positive for many people, it is VERY LONG in the waist. I am returning it. I love Zappos, but not this suit. 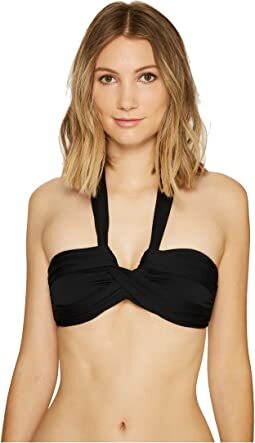 I really liked the look of this bathing suit, but it has boning in the sides which makes it so uncomfortable! Bending my legs made the boning poke into my belly. No thank you. Great cover up- a little see thru though! Cute coverup but it is very sheer, so nothing is actually covered up. Very expensive compared to similar items. 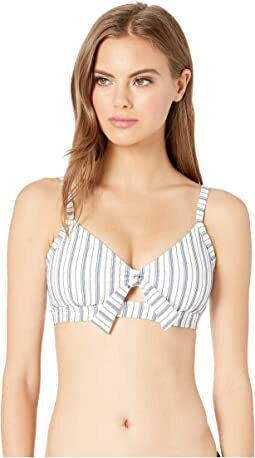 I love this swim bottom- I bought two i love it so much. Fabric and design are excellent. Seafolly's quality is exceptional. This brand is great for a flattering style for pear shapes ... the only problem is you have to buy several sizes larger than your usual size! Love this bottom and have it in numerous colors!!! I liked the way this looked, but decided on a breezy beach dress instead as a cover up. This was rather pricey for a single purpose garment. Cute but runs very small! I’m normally a 27 in jeans and I needed a US size 12!